ein hod: The Wrong Oscar? The New York Antiquarian Book Fair is the most exciting event of its kind in the world. This year’s, held in a hall on Park Avenue, drew a particularly glamorous crowd, following a pronouncement in American Vogue that book-collecting was the fashionable hobby of the moment. Among the works for sale were a fourth folio of Shakespeare’s plays and a first edition of Frankenstein; but for curiosity, little could compete with the three leather-bound volumes being touted in that last week of April by the owner of a small shop in Greenwich Village. Doing the rounds of the dealers’ stalls, Kim Herzinger explained that the volumes contained six Oscar Wilde manuscripts recently inherited by one of his clients. Here in the Irish genius’s own hand were the opening of A Woman of No Importance; a fragment of another play, never published or produced; a letter; a poem; the essay The Tomb of Keats. 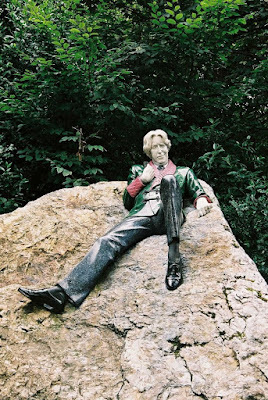 Most exciting of all, the cache included the manuscript of one of Wilde’s best-loved stories, The Happy Prince, which even if sold separately could be expected to fetch £200,000 or more – provided it was genuine.